Jane Jacobs pointed out technical reasons why two-way streets favor and assist the mass transit use of buses. The City’s Department of Mass Transportation has been unable to envision how the city transportation systems will be able to handle the extra loads associated with a project the size of Atlantic Yards. It will be a problem in terms of vehicular transit on the street and also because DOT has reported that the subway lines serving Atlantic Yards are already at maximum capacity and will not be able to be suitably upgraded in the foreseeable future applicable to the project’s construction. Without a good solution available, DOT flailed at the problem by proposing to accommodate Atlantic Yards by turning Brooklyn’s Sixth and Seventh Avenues into one-way streets. 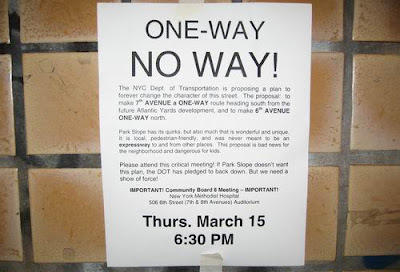 (Fifth Avenue is proposed to be partly shut down by the Atlantic Yards project.) If this were done it would be despite the particular technical problems for buses that Jane Jacobs pointed out, notwithstanding that mass transit buses might be the main hope available to deal with the sudden huge population Atlantic Yards would dump into this area of Brooklyn.